A perfect aid for a healthy diet: the seca 852 combines attractive design with high functionality and provides safe storage for itself. 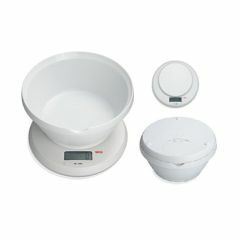 The diet and kitchen scale fits perfectly into the universal bowl for storage, is thus well protected and easy to store away. The bowl is made of high-quality, food-safe plastic and is dishwasher proof. It can be used both for weighing and mixing at the same time. With the TARE function, each newly added ingredient can be weighed exactly – high precision with a fine graduation of just one gram. The comfortable battery operation means that the scale can be used anywhere. The automatic switch-off function minimizes energy consumption.